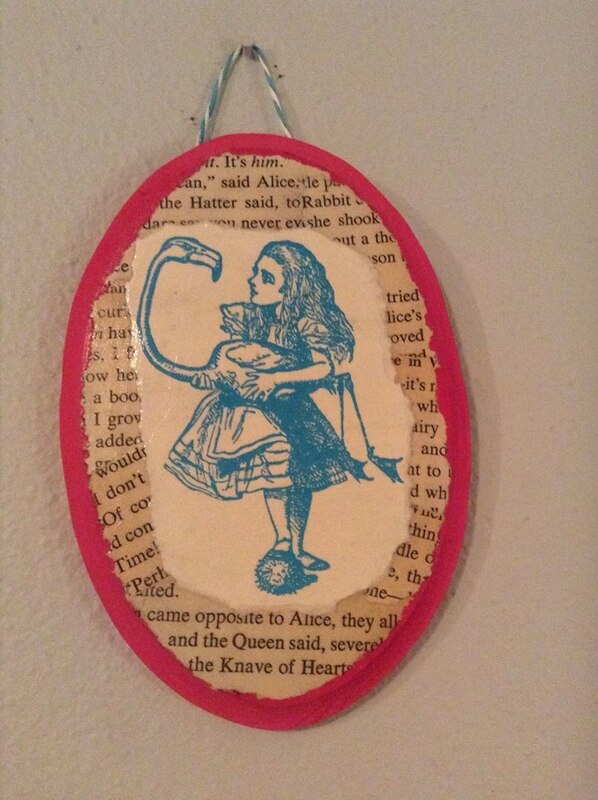 We have had a busy year creating our handmade bookish goodies of all sorts. As usual, we have particularly enjoyed our Saturdays selling them at the Dane County Farmers’ Market. Autumn is around the corner, and with it comes our last couple of months of farmers’ markets. I can hardly believe how quickly this season has passed! We hope you are enjoying the last gasp of summer and cherish the beautiful fall days ahead. As we look forward to fall craft shows and the busy holiday season, we would like to take a moment to thank all of our amazing local customers who visit us year after year and make this job so great. Your kind words, encouragement and repeat business is appreciated more than we can express! We will be down at the market Saturdays through early November and hope you will stop by to visit our booth whether it’s for the first time or the tenth time. 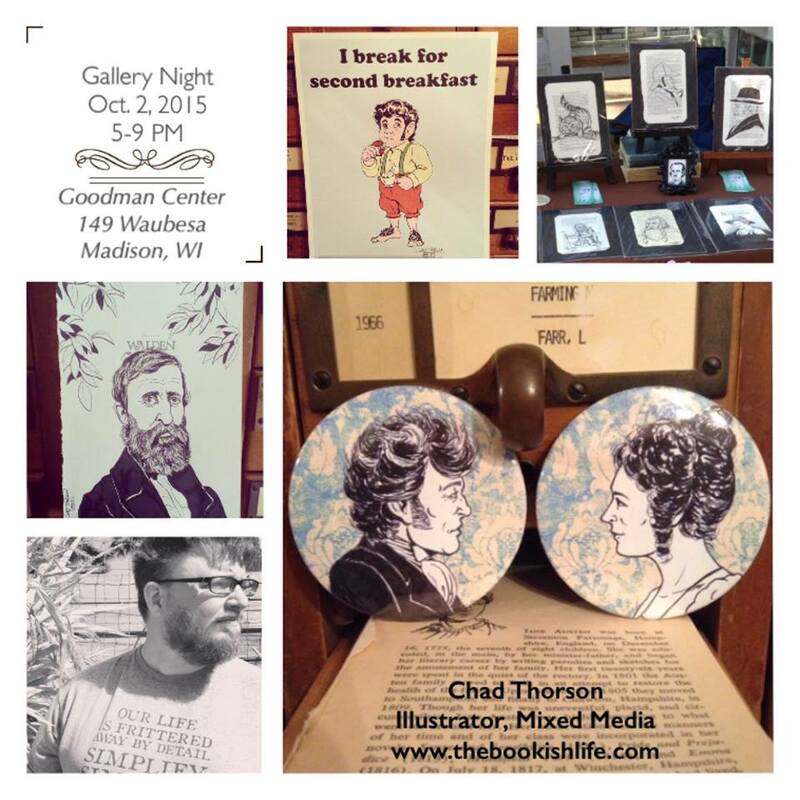 For our bookish friends who are not in the Madison area, please feel free to visit our etsy shop or check our event schedule for more upcoming shows! 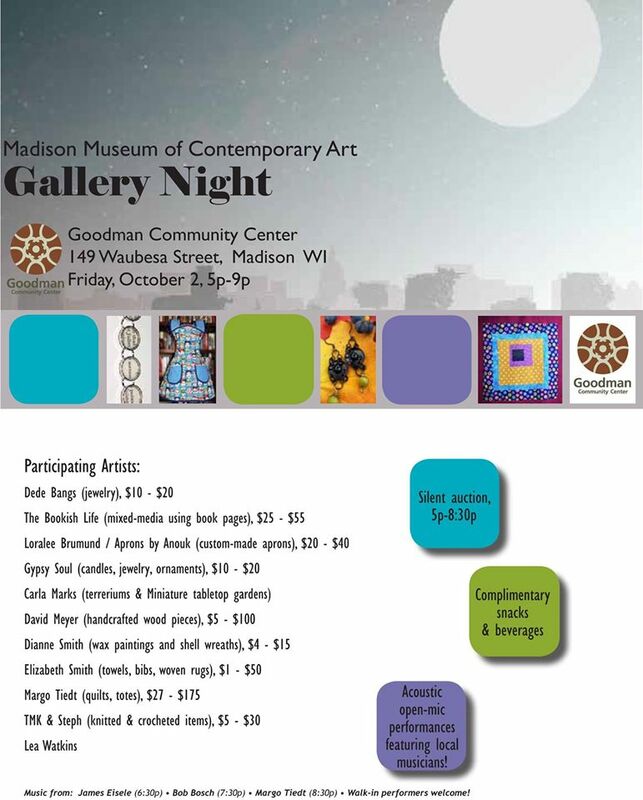 Tonight is Madison Museum of Contemporary Art’s Fall Gallery night! Artists throughout the city will be showcasing their work, and we are excited to be participating. 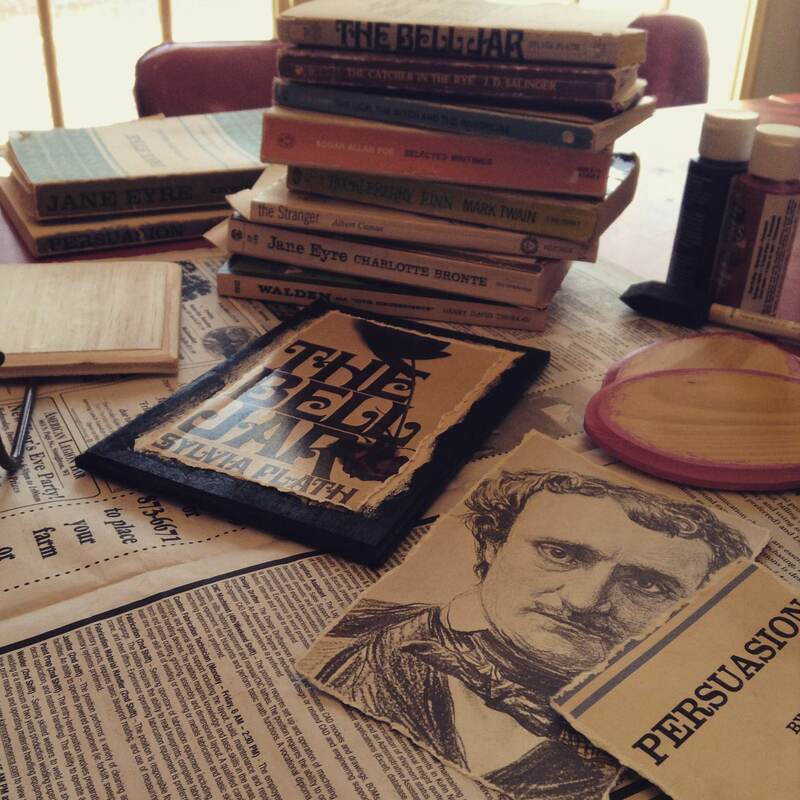 Chad will be at the Goodman Community Center showing some of his newest artwork inspired by literature along with some of my bookish jewelry. There will be several other artists at the Goodman Center along with live music and complimentary refreshments. Stop by to visit if you’re in the Madison area! My husband has created some really beautiful artwork this summer! These are a few of my recent favorites. 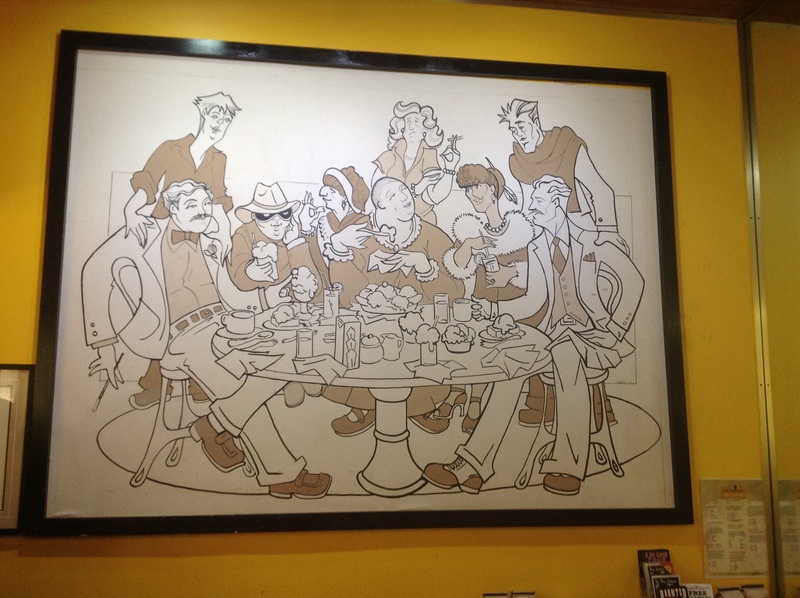 All of these are originals drawn on actual book pages. Sherlock Holmes, John Watson – on pages from The Return of Sherlock Holmes. 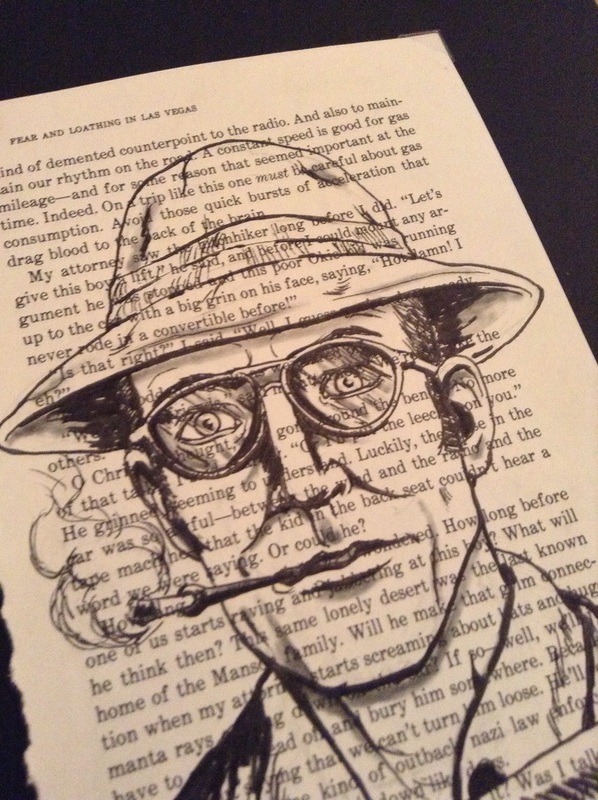 Detail of Hunter S. Thompson, drawn on a page from Fear and Loathing in Las Vegas. 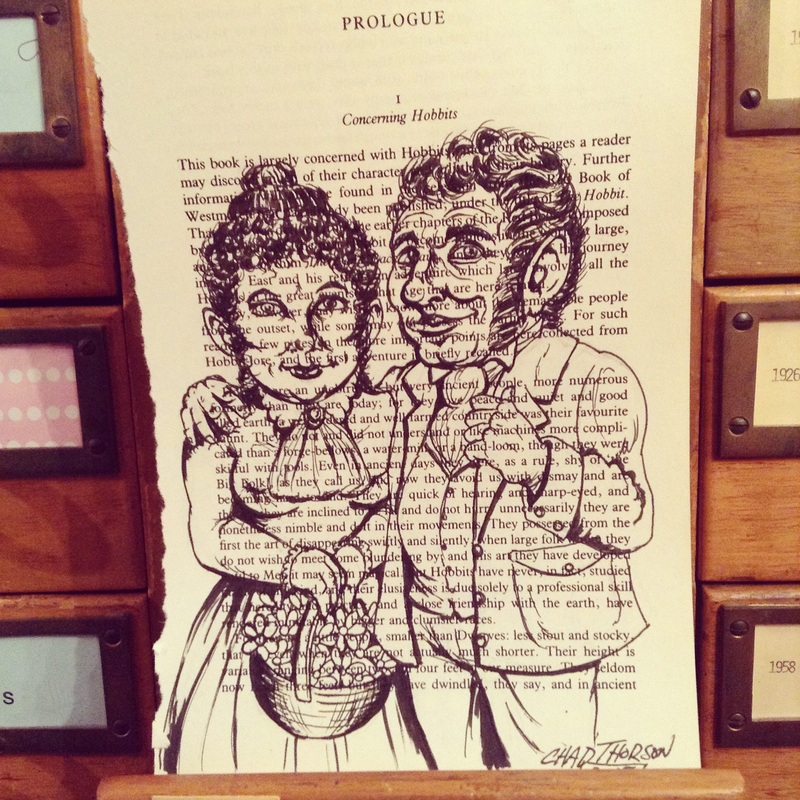 Hobbit couple, drawn on prologue page of The Hobbit. 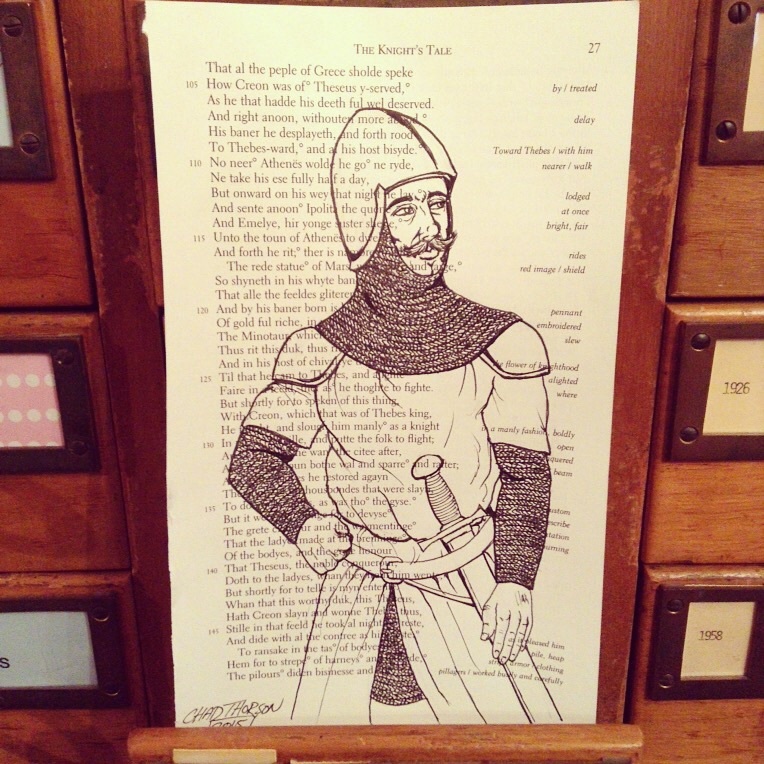 The Knight from The Canterbury Tales. 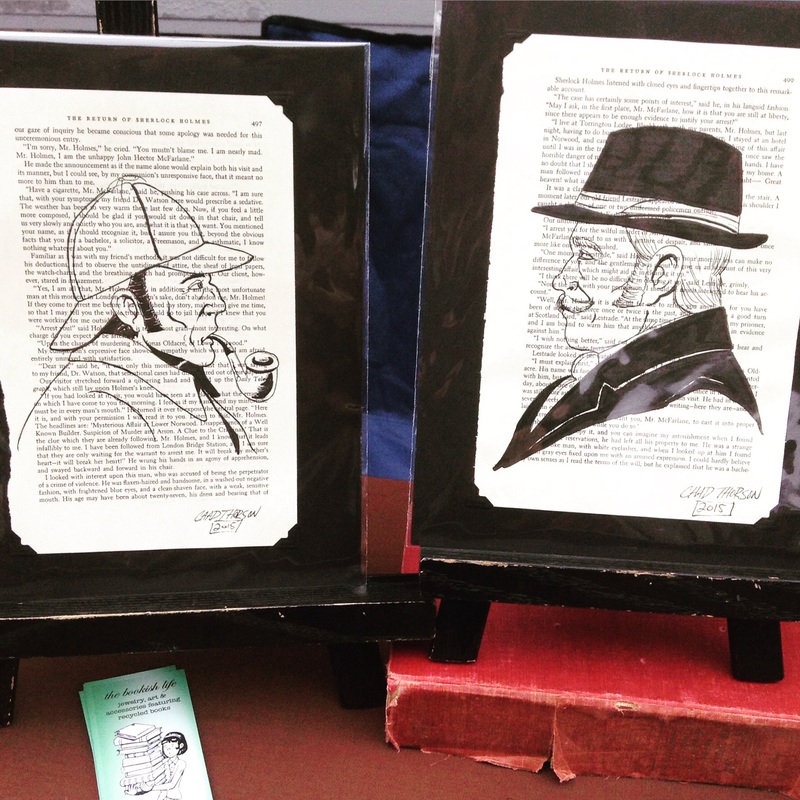 Come visit us at the Dane County Farmers‘ market in Madison to see Chad’s literary inspired artwork along with our bookish jewelry and accessories! We’re located near the top of State Street in front on Teddywedgers, Saturdays through early November. If you’re not in Wisconsin, you can always check out what’s new online in our etsy shop! We have lots of fall art shows in the works as well and will be posting soon to announce where you can find us through the rest of the year! We just returned home after an amazing whirlwind summer road trip. We stayed in at least 5 different states and passed through lots more. One of my favorite stops was New Orleans. I was not even sure what I wanted to see or do there. I was just excited to see a new city and finally visit my brother and his wife who have lived in central city, New Orleans for several years now. 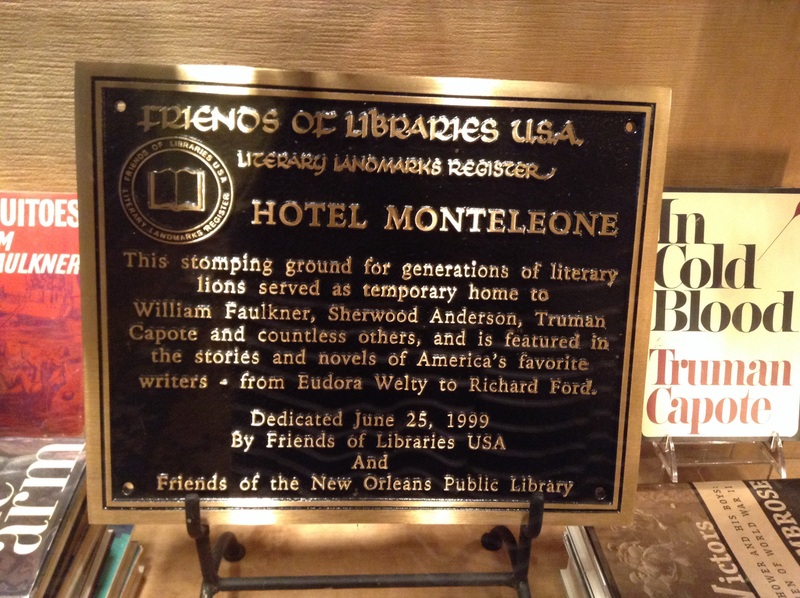 The only things on my to-do list were: beignets, bookstores and William Faulkner things. 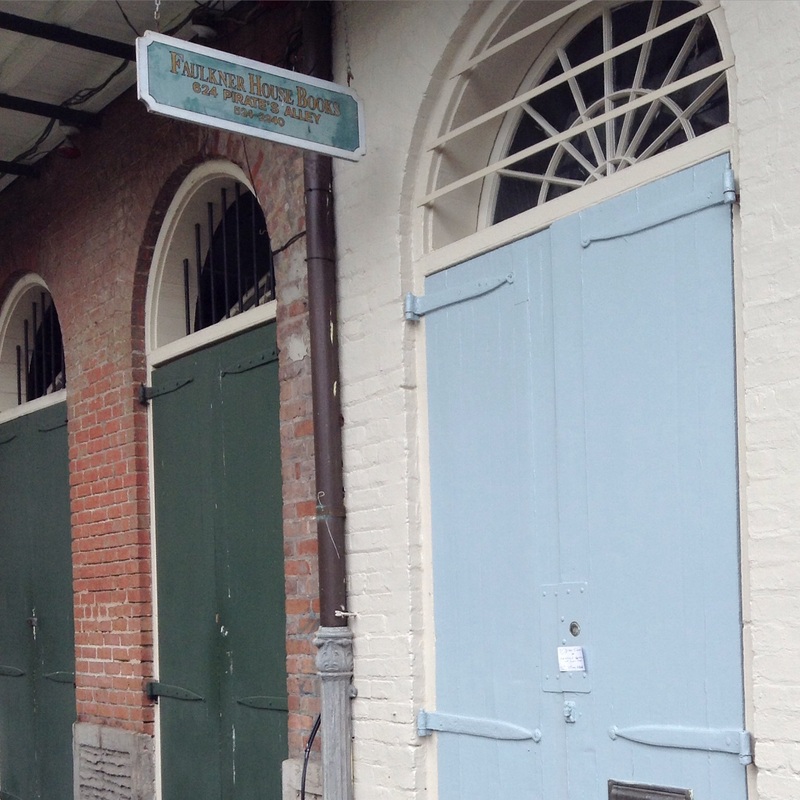 We got to see way more than that, but for now I am going to share my literary New Orleans experience. 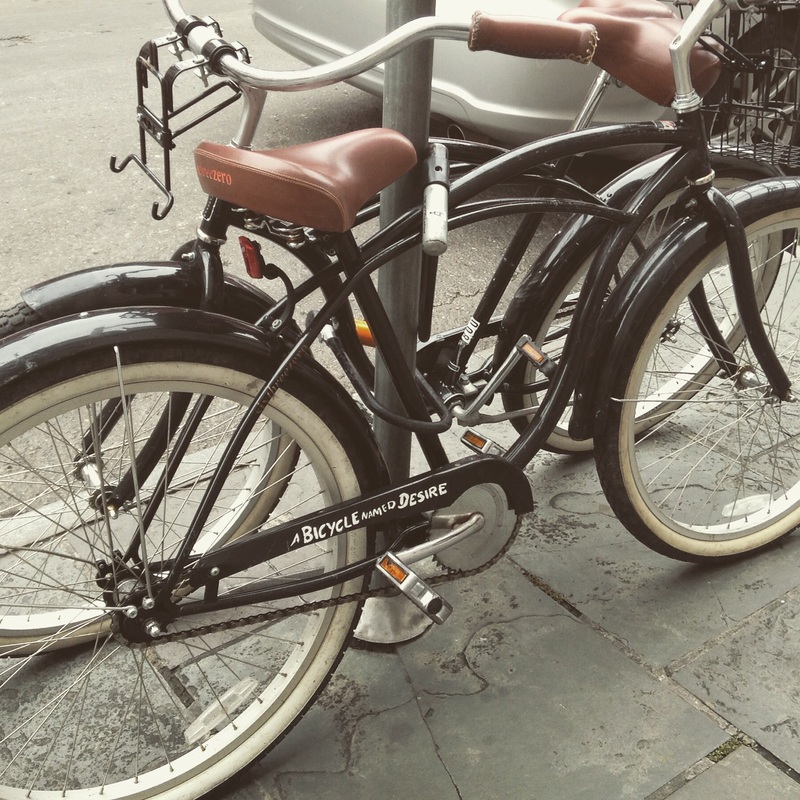 Spotted in the French Quarter, early on a Sunday morning. The first bookstore we stopped at was a small shop called Maple Street Book Shop. It apparently used to be separated into two shops next door to each other, one with new books and one with used books. It is now one shop with new & used books.The shop was charming and the owner was friendly. They had a little bit of everything. 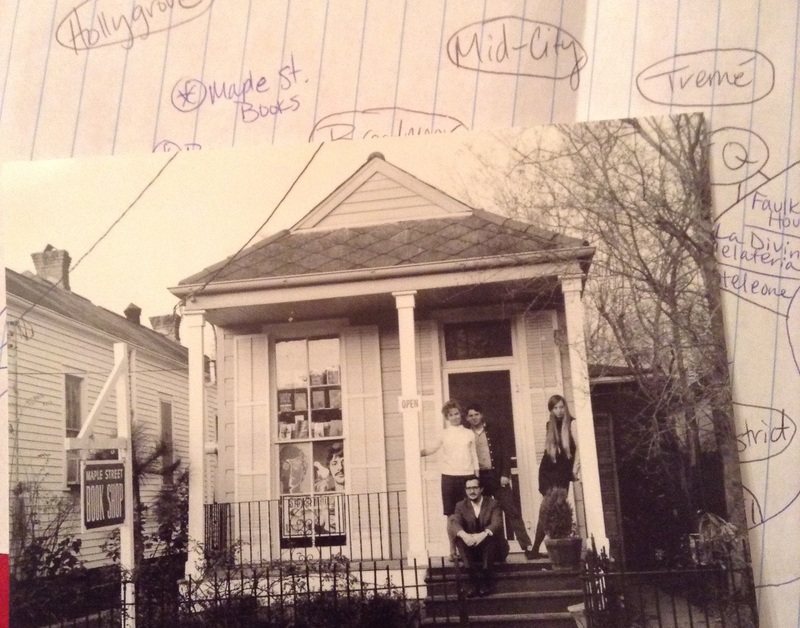 I especially liked their great selection of books about Louisiana and New Orleans. 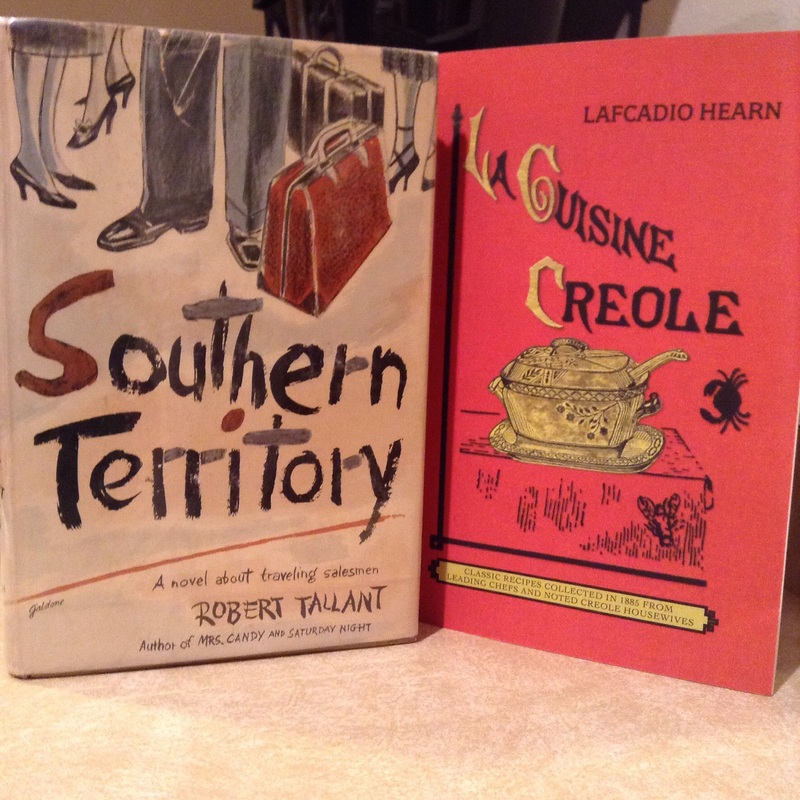 I picked up a new printing of a Creole cookbook that was first published in 1885. I didn’t snap a photo at the shop, but I did pick up a postcard that gives you a glimpse of it back when it opened (1964 according to the postcard.) I look forward to visiting again! I was looking forward to checking out The Faulkner House where William Faulkner lived and wrote his first novel in 1925. 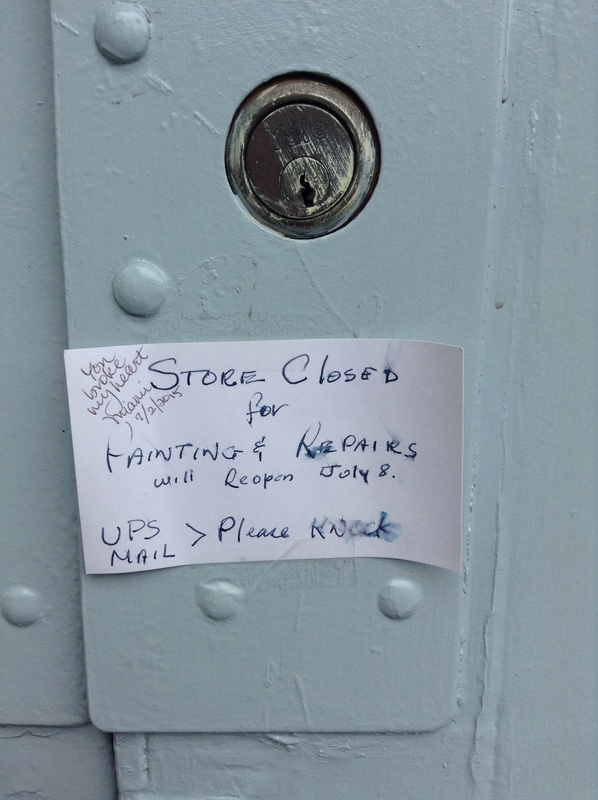 The first time I stopped by it was closed. I wasn’t the only one who was disappointed! 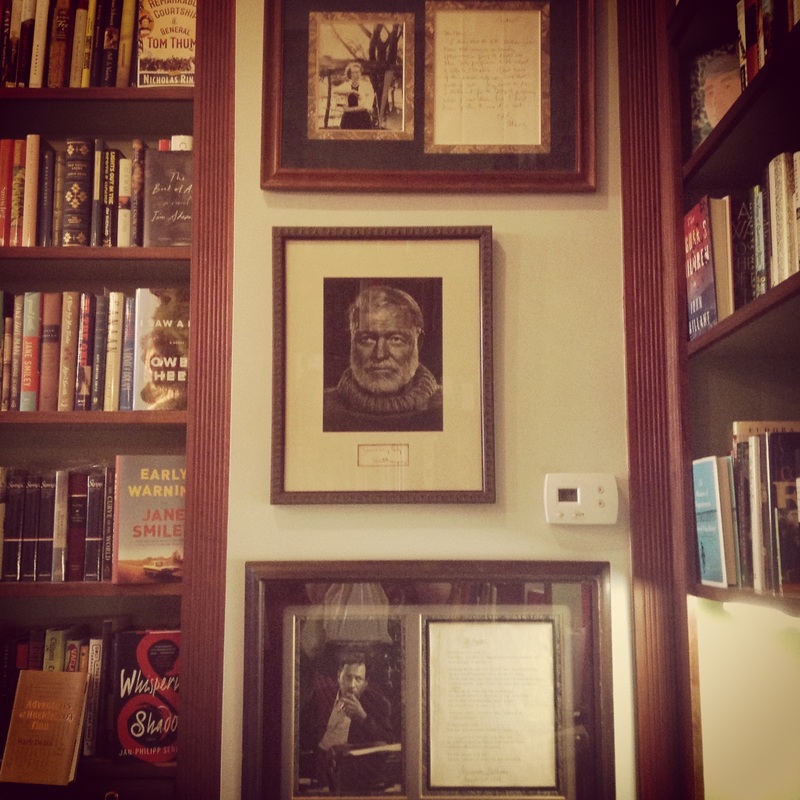 Faulkner House Books, Pirates Alley. 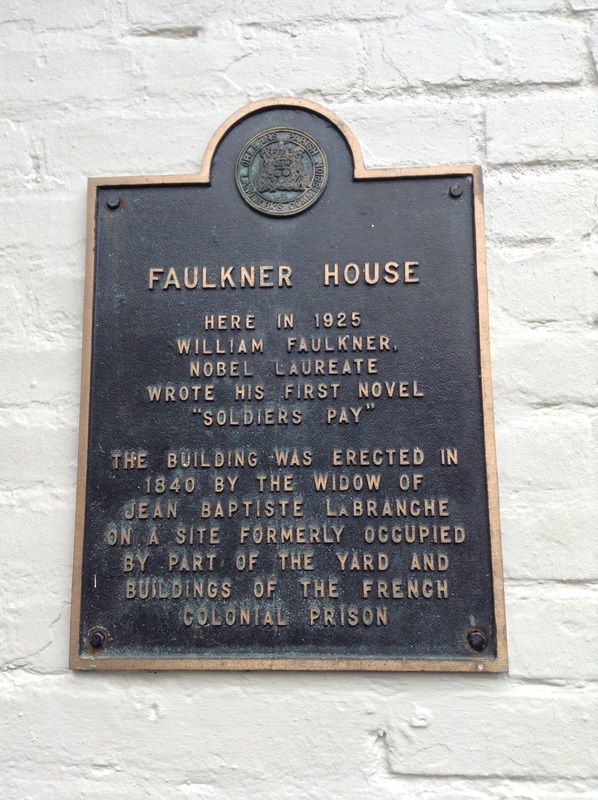 Outside Faulkner House Books, July 5, 2015. When I stopped back through on our road trip back home, they were open! 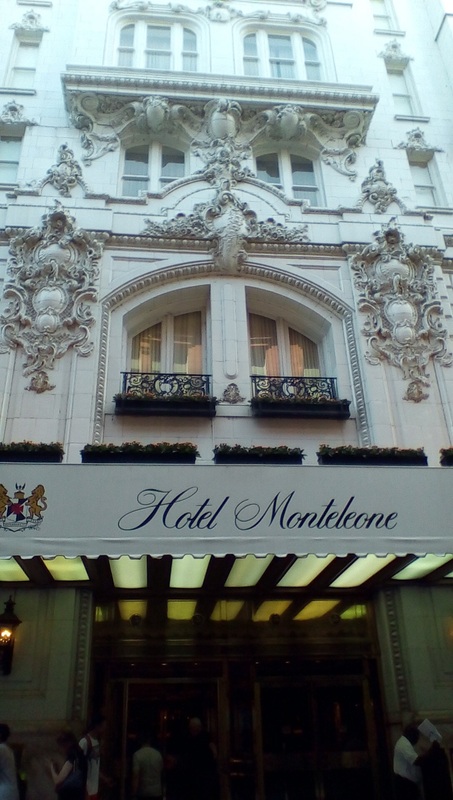 We stopped in the lobby at Hotel Monteleone on our first day in the city. 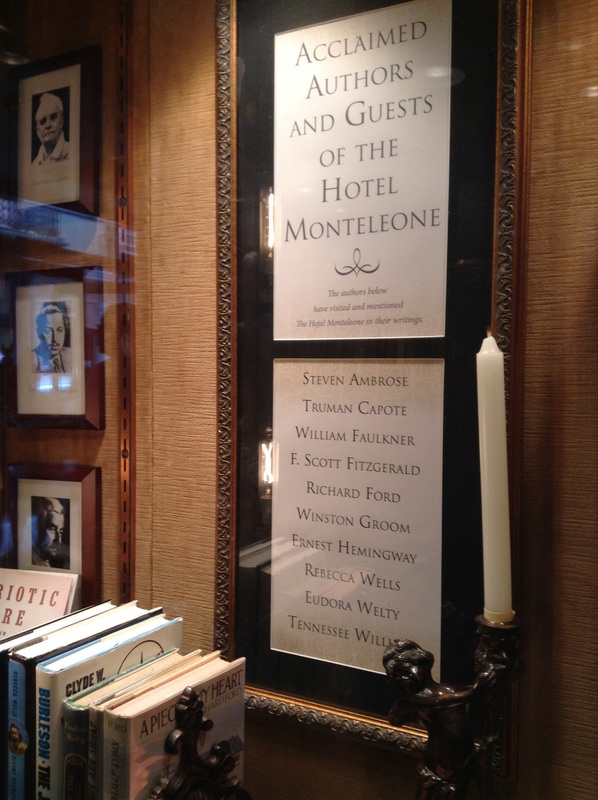 This historic hotel was where many famous authors including Tennessee Williams, William Faulker and Truman Capote stayed at. 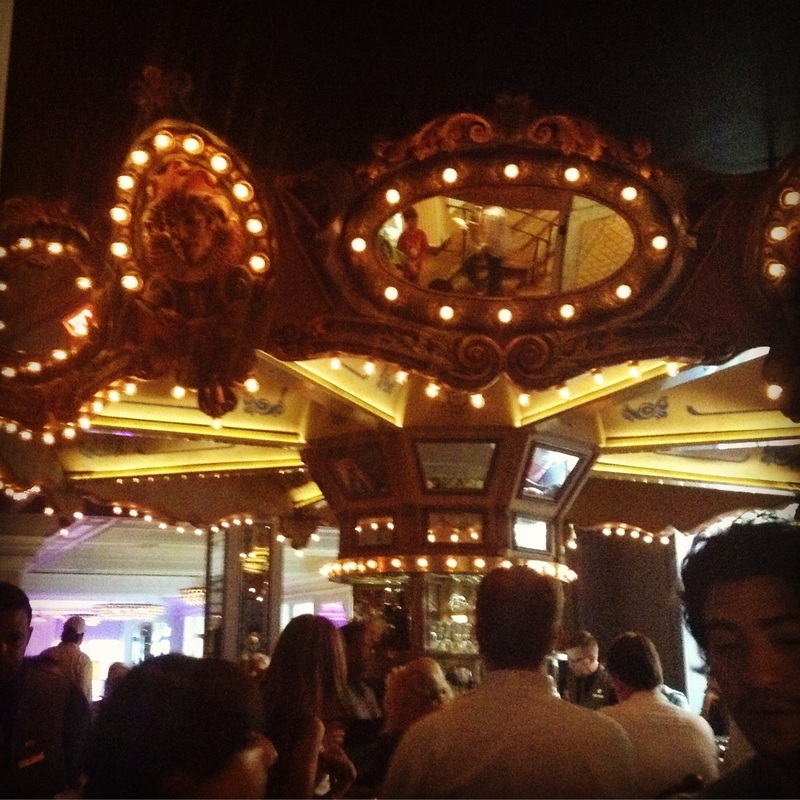 On our second stop through the city, we decided to stay at the hotel. We got a room on the supposedly haunted 14th (13th) floor. 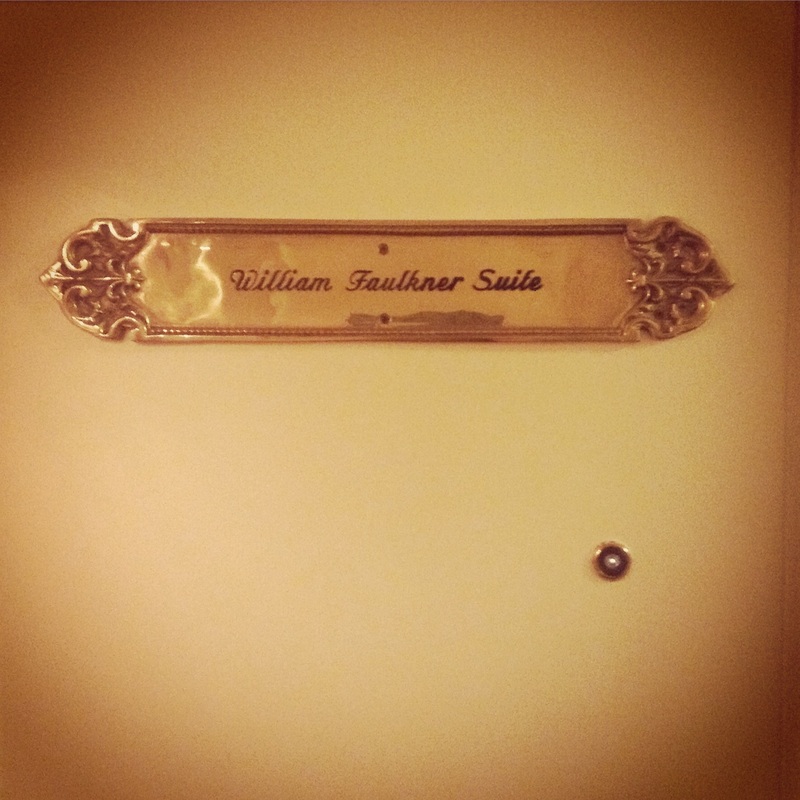 No ghost sightings, but we sure did enjoy our stay at this beautiful gem of a hotel! 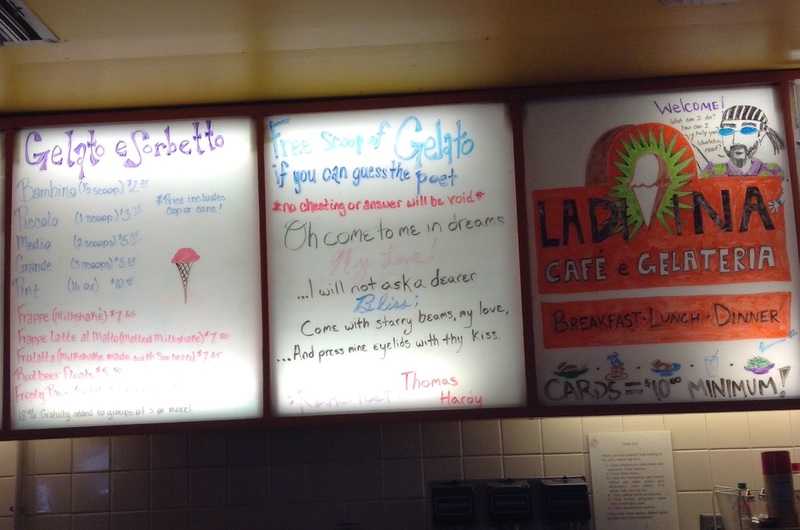 And finally, a couple of photos I snapped at La Divina Gelateria in the French quarter. I didn’t know the poet of the day. Do you? La Divina Cafe & Gelateria, New Orleans. I can’t wait to go back and explore this city! I know that I barely scratched the surface of all of the literary goodness New Orleans has to offer. If you have suggestions for our next trip, please leave a comment! 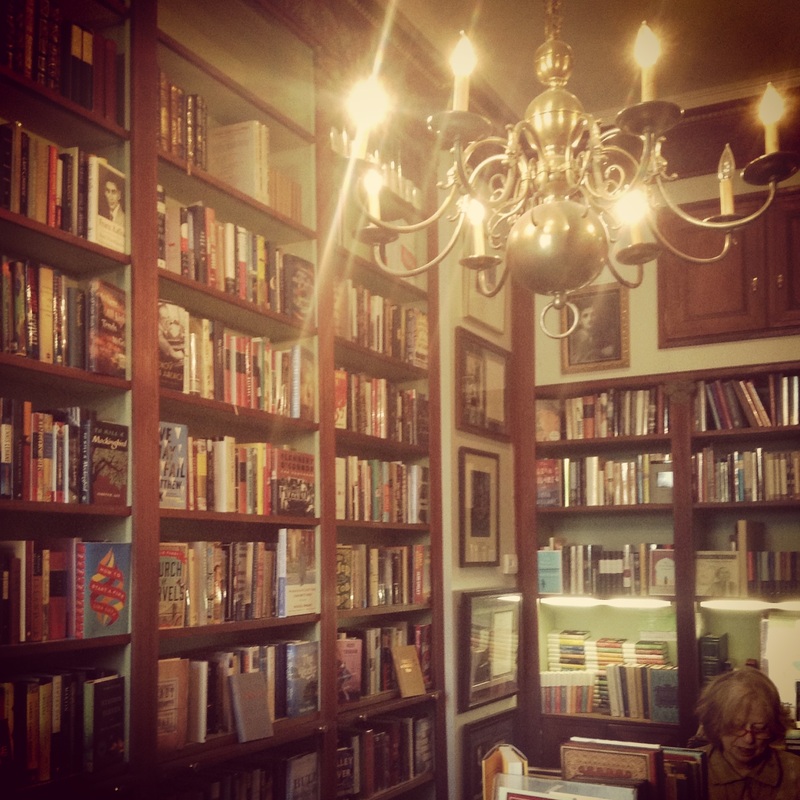 We would especially love to hear about your favorite New Orleans book stores! Although I have been taking my sweet time, I really have been creating some fun new things over the long winter. Here are a few little collages that I finished recently. 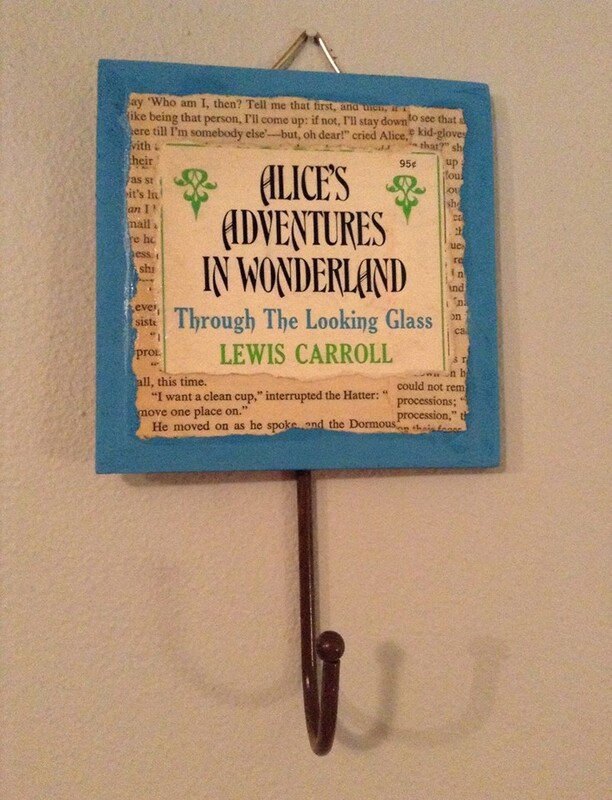 These wooden wall plaques combine pieces of book covers combined with snippets of book text. 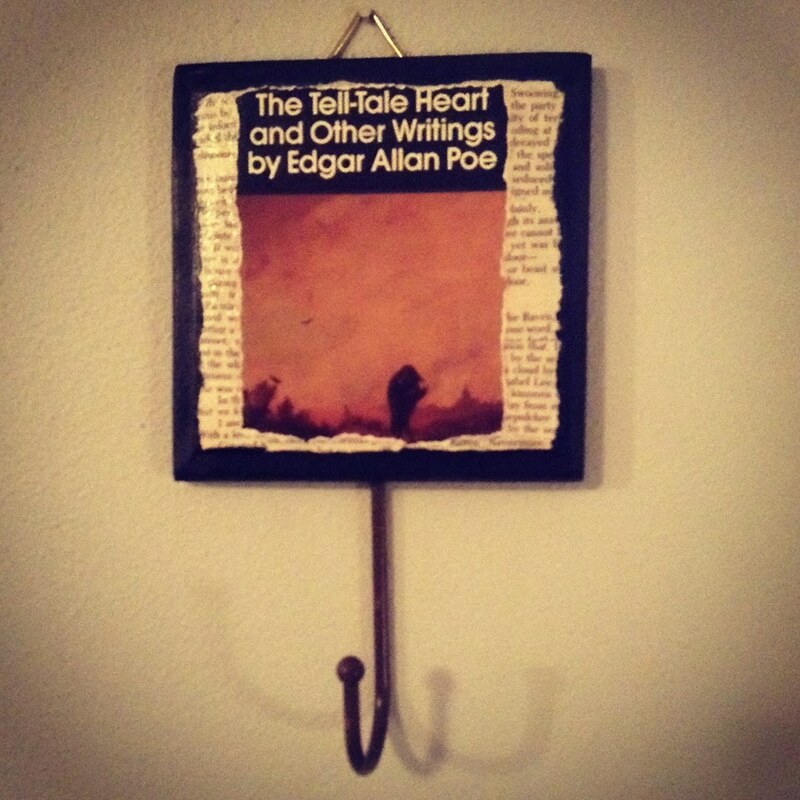 I made a few with hooks this year in case you need a special place to hang your book bag! I made a some of these last year just before the farmers’ market started and didn’t have time to make more through the season. These are all one of a kind! The pictured plaques along with several others will be available at our farmers’ market booth beginning April 18. Hope to see you there! Happy 2015! It’s just a little more than a week into the new year, and already I have made some lasting memories, survived the flu, and read two great books. 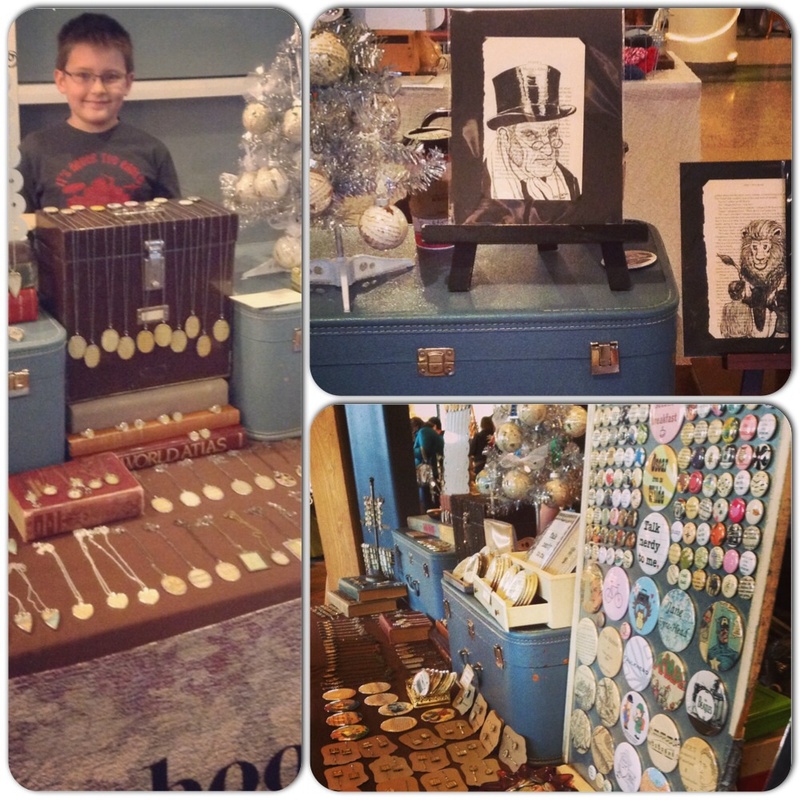 But before I start rambling on about the new year, I want to tell you about a few highlights of our 2014 holiday season. First, thank you so much to all of our wonderful customers, friends and family who were supportive of our small business over the past year! You helped to make 2014 the best year yet for The Bookish Life, and we cannot thank you enough. We are sincerely grateful to every person who helped spread the word about our little etsy shop or our stand at the farmers’ market, and each of you who chose to buy a piece of artwork, a necklace or other handmade trinket to give as a gift. We were grateful to participate in 3 successful holiday shows in the month of November and to have a busy holiday season in our online shop. Here are a few shots from our holiday shows, one with my 10 year old helper! 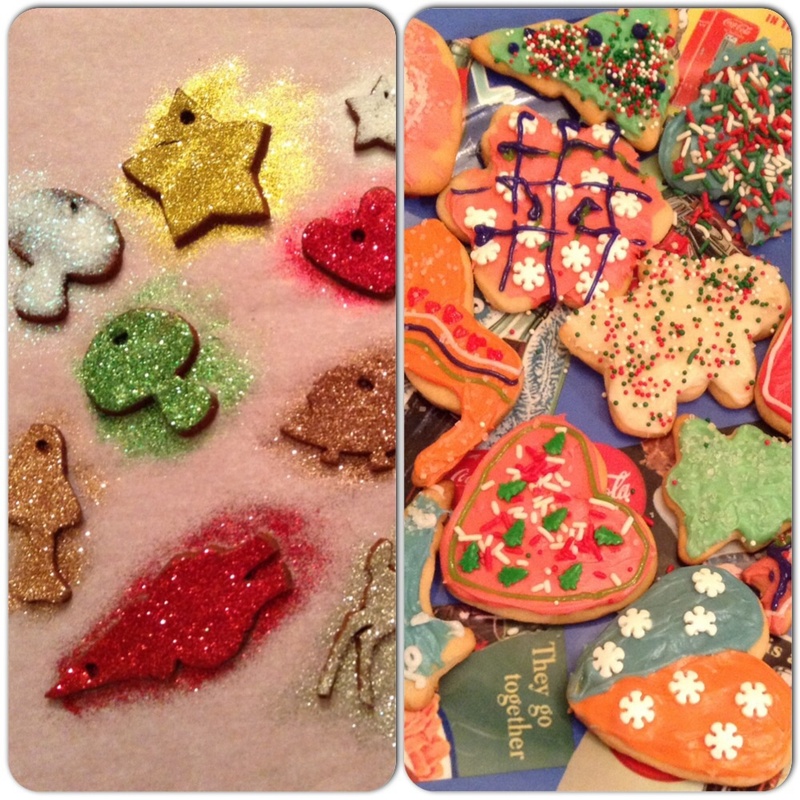 After the holiday rush slowed down, our family enjoyed some downtime and a little holiday magic. 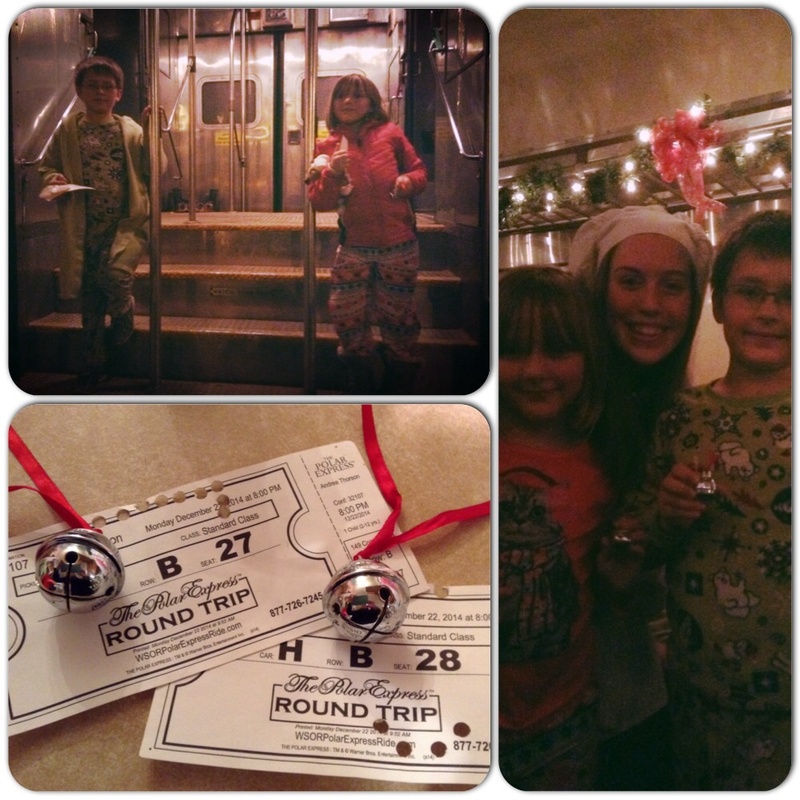 We took our kids on a Polar Express train ride just before Christmas. The train was decorated like the train from the book and went to the “North Pole.” We got cookies and hot chocolate, and the kids got a special bell from Santa. My favorite thing about the experience was when our kiddos danced up and down the aisles with the chef. It was just so sweet to see my 8 and 10 year olds full of holiday spirit. 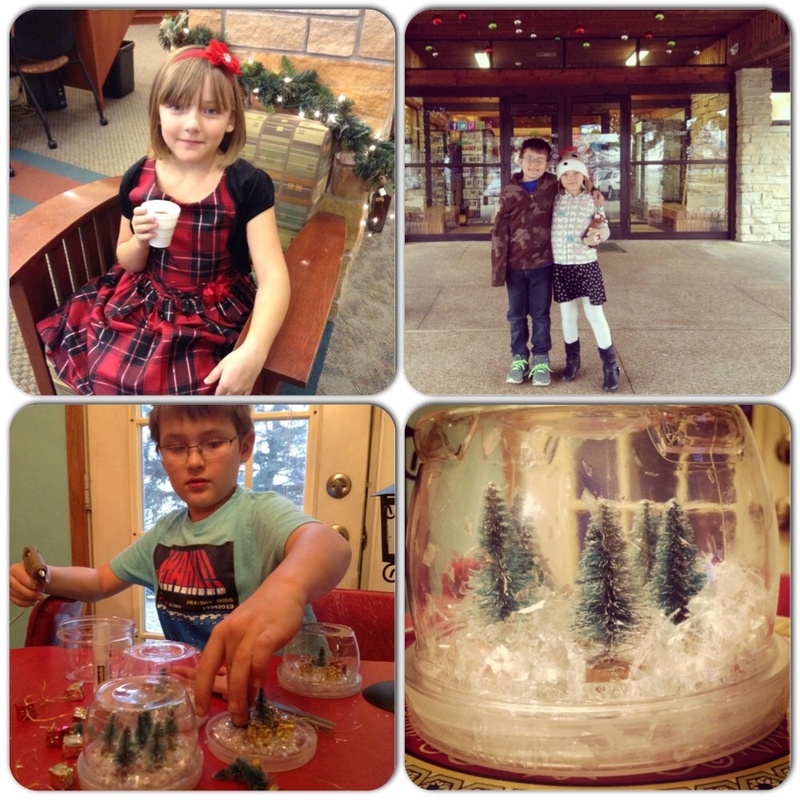 We enjoyed a day at our local library sipping hot chocolate, listening to a local musician and seeing real live reindeer. We also visited a train and lego show at Olbrich Gardens, and of course we did our fair share of holiday crafting and baking. And just like that, 2014 is gone. We hope that you had a beautiful year and that 2015 brings you happy days, good books and rays of sunshine when you need it most. It’s hard to believe it, but our final show of 2014 is coming up this weekend! Please stop out for this wonderful show at the Masonic Center in Madison, Wisconsin on Saturday, Nov. 29th. If you’re looking for unique, handmade gifts made by artists and crafters in your community and beyond, this is the place to visit. There will also be free goody bags for the first 50 shoppers! Hope to see you this weekend. Have a lovely holiday season, friends!